The cleaning begins with hoovering and inspection. The cleaner will determine the upholstery type, its condition and which stains and areas need to be pre-treated. All solutions are tested before being applied. The cleaner pre-treats all stains and dirt patches. There are detergents for different stains like fruit stains, makeup stains, coffee stains. After that, either steam or dry cleaning is performed. Stain protection can be applied as well as deodorising on demand. We have the appropriate solutions, training and equipment to professionally clean these types of fabrics and materials: cotton, linen, synthetic, silk, wool, plush, viscose, nubuck, suede, chenille, acrylic, leather, organic fibres. For durable materials, the cleaner will use a hot water extraction machine, but for velvet, suede and other delicate materials dry cleaning is used. 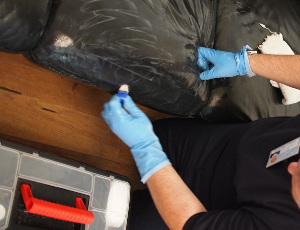 We provide a highly efficient and safe suede and leather sofa cleaning service. We can safely clean mat leather. Professional leather rejuvenator and conditioner are applied afterwards. Excellent Carpet Cleaning first began providing the residents and businesses of Harrow HA with high quality deep upholstery and sofa cleaning services back in 2005. We have invested in high tech professional cleaning machines and the best detergents. Our cleaners are trained to clean any kind of upholstery and sofa. Along with that, you can book professional deep mattress cleaning, bed bug mattress treatment, blinds cleaning, curtain cleaning or drapery cleaning. You will receive a discount if you combine several of our services. Our cleaners are trained and equipped to provide you also with thorough drapery and curtain cleaning, mattress cleaning, bedbug treatment and blinds cleaning. You can book several services simultaneously, and we will do them in one visit and at a lower price. The mattress cleaning technique is fast and efficient. It doesn't use moisture for the deep cleaning of mattresses and pillows. Our cleaning specialists are equipped with special intensity ultra-violet light which eliminates allergens, bacteria, dust mites and other harmful particles which can cause health issues like asthma, runny nose, dust allergy, eczema, headaches. The more services you book, the bigger the discount you will receive. Call our 24/7 customer support centre on 020 3404 0500 or via the online contact form on our website. You will get a text message or email verifying your order. We ask for no deposits and you will pay after the service is done. We have fixed prices. We offer discounts to customers who book more than one of our services at once. Regular customers, estate agencies and landlords will get our preferential prices for cleaning services. We can come on any day you want, even on the same day you've call us to clean your sofa. Get our professional sofa and upholstery cleaning service now!